I seem to be asked more and more often to recommend wines to lay down for newborn babies, preferably dated with the relevant birth year. This is presumably a result of wine’s increasing popularity as a leisure interest around the world – perhaps encouraged by the legion of salespeople who have been trying to position wine as an attractive financial investment. I find I am quite often asked to recommend wines made in a certain year even months before the grapes are picked. Many new parents are so thrilled by the idea of starting a cellar for their progeny that they forget that it is generally necessary to wait at least until the baby’s first or ideally even second birthday before making a well-informed decision. Most parents suggest that the chosen wine or wines should ideally be good to drink from about its, and the baby’s, 18th birthday (21st in the US) and ideally for many years after that. This limits the choice considerably. The vast majority of bottles on sale are past their best at two or three years old. It is no accident that the classic godfather’s liquid gift was a pipe of port. A pipe is the equivalent of 550 litres, or 733 bottles, surely too much for even the thirstiest port enthusiast. But vintage port, the sort of port that carries just the name of a shipper and a vintage and is released at just under two years old, has the great advantage of lasting longer than almost any other sort of wine. In fact it is a pity to open a bottle at under 20 years old and vintage port can easily be in its prime at 50 or even 60 – just like a newborn. Those on a budget and in more of a hurry may like to consider the little brothers of vintage port, so-called single quinta ports, wines made from a single year like vintage port, but from a single one of the top farms, or quintas, rather than the tiptop blend assembled by a shipper. These wines, generally less than half the price of a vintage port, are likely to be at their best at about 20 to 25 years old. Single quinta ports have been put on the market much later than vintage port, with vintages 1998 to 2001 currently available on the market, but the British shippers have just started to offer the 2012s as futures. The other obvious choice is red bordeaux. Top-quality examples are designed to last for decades, although unfortunately nature has been rather unco-operative in recent vintages. The last really successful red bordeaux vintage was 2010 (my divisible-by-five rule has been working nicely) but it was priced sky-high. Really skilled cherry-picking is required to identify the red bordeaux from the 2011, 2012 and 2013 vintages that will provide delicious drinking two decades from now. 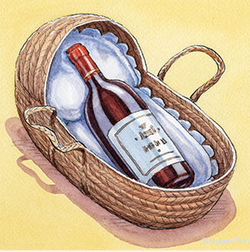 I reckon sweet white bordeaux would be a great choice for laying down for a newborn because these wines, unlike their red counterparts, are underpriced and can last even longer. But you do need to go for a blue-chip producer to be sure. Red burgundy, as always, is much more of a minefield – and prices in recent vintages have been zooming up, particularly for the elite wines that are most likely to last at least two decades. And until we have incontrovertible proof that the premature oxidation problem has been solved, I would not recommend anyone choose white burgundy for long-term storage. Still in France, Hermitage both red and white would be a fine choice for long-term cellaring. The best easily last 20 years; I am enjoying some from the 1980s at the moment. As for southern hemisphere wines, however impressive many of them can be, only a handful have a track record of ageing majestically over decades. Penfolds’ top bottlings such as Grange are the most obvious example but Henschke’s Hill of Grace and Mount Edelstone have earned their spurs, and are being chased by rather fewer collectors around the world. Many of the wines will not be available for some time. Where I have made specific suggestions, I have given average prices per bottle as listed on winesearcher.com. I’m sorry they are relatively high, but cheap wine is just not worth keeping for decades. If you want to personalise your choice, you can put the name of your child into the search box of winesearcher.com and see what comes up. It is far too early to have any idea of the likely quality of wines produced in the northern hemisphere. The vines have not even flowered, although vintages ending in 4 have rarely been particularly successful cellar candidates in Europe. 2004 Rioja Reservas are exceptions. The obvious choice here is vintage port. The 2011s are some of the most glorious ever made. (Taylor, Fonseca, Graham, Quinta do Noval, Niepoort £50-60; Cockburn £44). If you insist on a dry wine, consider a top north Rhône (eg Chapoutier, Ermitage Le Méal £106). But this was a difficult vintage for Australia, California and much of Europe. Red bordeaux is the obvious choice but the top wines are ridiculously expensive. Seek out the (many) less glamorous names with a likely long life. You could also try Barolo, the 2010s are just becoming available, or a top-quality sweet German which may outlast the lot of them.